Whether projects require absorbers, reflectors, and/or diffusers, the subject of acoustic treatment now arises early in the integration conversation.The speed of sound is no joke—no matter what the frequency, those waves are streaking towards you at 768 miles per hour. When acoustic treatments are on hand to calm those sound waves, AV installations become more appealing places. 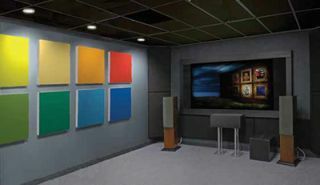 Tools of the acoustic treatment trade are becoming more important for AV integrators to get ahead of, as the marketplace becomes increasingly aware of their role in treating a room. Whether projects require absorbers (to attenuate sound), reflectors (redirect), and/or diffusers (uniformly distribute it), the subject of acoustic treatment now arises early in the integration conversation. Growing awareness on the topic among clients appears to be healthy, with houses of worship, medical teleconferencing, call centers, open-office environments, home theaters, and educational spaces all being identified as areas of growth for acoustical treatment. But change hasn’t come easy here. Looks matter at Aurelex as well, which designed the ProGo portable absorber to appear upscale while soaking up sound in a variety of environments, including living spaces. Meanwhile, their patentpending SheetBlok-AF is an aesthetically pleasing sound barrier, providing a solution for both new construction and retrofits where ideal sound isolation was not achieved. Acoustics First’s aforementioned flexibility comes from products like their PhaseFOAM and Tone Tile acoustical systems, both of which allow integrators to purchase materials in small quantities. That facilitates a purchase of only the exact amount of material needed, or of additional material as the budget or facility expands. “PhaseFOAM is an acoustical kit designed for small and private facilities,” Larkin said. “The material is packaged to lessen the ‘buy-in’ blow to your budget. A couple of kits will get you started for many applications including broadcast studios, recording facilities, home theaters, home listening and gaming, and more. For contractors who stay on top of acoustical treatments, these components can be a cornerstone of an expanded practice—one that helps their clients to get where they want to go faster and more cost-effectively. “Fixing the acoustics in a room is generally a lot easier that putting up a sound system,” said Janis. “There are of course different degrees of performance, such as concert halls that require acousticians. But for the most part, applying 25 percent coverage to the available wall surfaces will solve 90 percent of the problems. And once you do your first installation, the rest become second nature. Larkin advises AV designers and integrators to look ahead to what the room will sound like when the installation is completed. “Think ‘acoustics first’ and don’t get caught off guard when the sound system installation is complete,” he said. “No amount of electronic equipment or EQ can correct the physics of the room. We work with many integrators who include acoustics as part of the complete sound system package—these integrators know acoustical material should be included in the design phase. While technical excellence is always the goal in AV installations, a well-honed acoustic environment has emotional advantages as well. Tame those speedof- sound waves, and a sense of wellbeing just may become an element of the install. 1 Boardroom/Meeting Rooms - the trend is very open concept with no absorption in the space whatsoever. The increase in conference calling and distance presentations is turning these facilities into mini broadcast centers. 2 Classrooms/Lecture Halls - Essex Study in England has piqued interest in acoustic treatment outside of music departments. There is a move away from carpeting and padded seating. 3 Office Spaces - Open concept offices create sound issues around privacy and focus/ productivity. 4 Restaurants - Allowing owner/operators to control the energy. Second most common complaint by patrons in restaurant business is volume, after poor service.